...and Team AE7EU (KU7F, WN7K, W7JHR and W7SCY) got snowed on at the Lake/Klamath county line in Oregon. Operated portable (Expedition) again this year from Shine Tidelands State Park on the west side of the Hood Canal Bridge in Jefferson County, WA. When I arrived at 10:00 am I was the only one in the Park! I set my stuff up (Hamstick on the car, four 16 ft radials string out to PVC posts slid over re-bar stakes) and got started about 1723Z - 20 meters was great - s&p on Phone and run run run on CW. Then the tide went out ... and the clam diggers arrived - and the families with dogs and little kids in vans and SUV's - pretty soon the place was FULL with an SUV parked against one of my radial posts, people ducking under the wires, and dogs peeing in front of the car. Whatta zoo! Did a little ham radio PR with curious visitors. The weather was great. Went QRT about 5:00 (0000Z) and I was home for dinner! Wow! That was fun! After much thought I Decided to enter the same category as last year and try to better my score. The conditions were fairly good for the most part except above 20M where the signals were few and far between. 15M had a ghostly hollow sound, if it was open at all. 10M, 6M, & 2M were totally devoid of life. 20M was the real workhorse providing 75% of all the Qs and 99% of the Mults! Since everyone was looking for 7-landers I was able to find a frequency and run rate almost all of the event! Some of the pileups grew rather large which was pure joy to work down. When it was finally over the final score to my surprise was well beyond expectations! Thanks to all who worked me! See you in the next event! Great time, new radio, first time with SO2V ops, spent the last week trying for SO2R.... couldn't get it to work. That is likely a good thing, because I spent a whole lot of time learning and not Q'ing. The BIG surprise was the minor storm, with aurora flutter on stations from WI down to IL, on 80, and RBN reports of 30 to over 40 db SNR. That encouraged a couple of +60 rate runs on 80. And, just to prep for FD... it was all Solar powered too, with wire antennas. What a blast, meeting old friends and making new ones too. See y'all in the next test! Had lots of fun in this one, as always. Even beat last years score, though with fewer mults. It seemed to be a bit of a struggle to work the east coast guys on 20. Things really picked up on 40 and 80 in the evening, I had some nice runs there. Thanks for all the QSO's! Conditions not as good this year, maybe because of the drowsy Sun. Nice to find a little action on 15 meters. Thanks for the Qs. Sure glad we have all those 7-landers to work. Had multiple radio failures, computer got so hot it crashed, but we carried on making contacts. First time on HF for half of our operators! We all had great fun. Thanks for the contacts! The plan was to do a 500-mile route, 11 hours of driving and 7 hours of sitting, operate while moving, use a recorder to copy the audio, and transcribe it later. Use the computer to log when sitting. I'm okay with paddling while driving. Things went pretty well. 20m seemed noisy and not very productive. The noise turned out to be from the inverter that powered the computer. But when evening came and I switched to the homebrew low band antennas, it all worked very well and no noise. I found myself doing 85 mph on the open highways to shorten the driving time. During the day I used a 40/20/15m 'pitchfork' of Hustler coils. After 20m started to die, I went to homebrew single band antennas. The top of the big 40m antenna is at 12 feet, the 80m antenna is 13'6" and guyed. Oregon legal max height is 14 ft. Both played way better than the Hustler HF coils on the 'pitchfork' mount. I could call CQ on 80 and get answers from the New Englanders. The rig is a 100W TS-480SAT. The bad news was trying to put the log back together on Sunday. It took 12 hours of tedious listening to endless CQ's and noise broken occasionally by a QSO. This made Sunday in Sweepstakes seem easy. Final tally was 757 QSOs and 50 mults. Missed ND, MS and NM plus all the VE's except BC and ON. I made about 70 QSOs in each of the 11 counties (and some rare grids). I put all 11 county logs into LOTW. Participation seemed good this year despite the lack of good high propagation, I only worked just one European but got HC2AO on three bands. Next year I'll hire a driver if I have to! Not the best propagation over the weekend. I think I contacted one New England station outside of Connecticut. That has to be a record. Most of my QSOs were with 7th call area stations on Saturday. I heard fewer stations calling for the Indiana QSO party than I usually do. When I started wondering where the New England stations were on Saturday evening, I looked on 80 meters. There they were. I tend not to operate on so much on 80 meters because my antenna is too short and it makes the smoke detectors go off. The dog doesn't think much of that idea. In view of the propagation, I'm not entirely disappointed with my score. Still need to improve my antenna system -- and my CW! Almost as many Q’s as mosquitos this year! For most of the past year I have been searching for a suitable county line location, both in person and on Google Earth. Finally, I found a good one on the DES/LAK line just off NFD 18 north of Fort Rock. It turned out to be a super campground with numerous 75-foot trees. No one bothered me during the whole time, and I was treated to a coyote chorus late Friday night. I erected my trusty 40 meter EDZ north and south, but unfortunately, it was not the best antenna on 20 meters, as one of the nulls was toward New England. I'm thinking of a 20 meter collinear for next year. I was a bit disappointed that 20 let me down. 80 meters was, as always, a night time delight and gave me a large portion of the total Qs. We'll see what happens next year! I had planned a route of 427 miles covering 10 counties and five county line operations. I made the first two stops and had 160 Qs in the log. Then, the radio broke. 399 miles of driving and only four counties put on the air. Sorry if I disappointed anyone by missing the others. 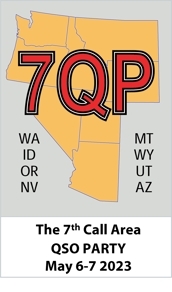 This was my third County Expedition, and the second to Cochise County, AZ for 7QP. Previously I had used a 40-10 fan dipole, but chose the Alpha Delta DX-CC for the addition of 80m. I made that decision Thursday morning, and spent most of the day tuning the antenna in the operating configuration hung over my mini-van at 20 feet. That was time I had not planned for. However, that choice paid off handsomely with 113 QSOs and some nice runs on 80m from an antenna with the ends only five feet off the ground (and two feet over a large prickly pear cactus). Shear panic set in just before the start of the contest when my notebook computer would not boot. All I got was the clicking sound of a crashed hard disk. It had worked fine the night before during station checkout. The temperature had dropped considerably to where I had on three layers, so I thought it might the temperature. Fortunately, after a half a dozen attempts I got a successful boot. The temperature would warm to the mid-90s latter in the day. My new mini-van cooling system worked great. The longest run was 82 QSOs on 40m lasting 70 minutes. Lots of fun. Just missed the 600 Q mark. The rig was a TS-590S. At the 7QP last year, I put a sign on my van telling people to stop by, say hi, and see the sport of ham radio in action. No one did. This year, I dispensed with the sign and had four or five parties stop by with great interest and learned something about ham radio.